WASHINGTON (CNN) -- Iraqi Prime Minister Nuri al-Maliki heads to the White House on Tuesday to meet President Barack Obama with the need for a timely election in Iraq dogging him. 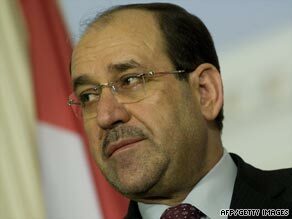 Iraqi Prime Minister Nuri al-Maliki is heading to the White House. Waves of destabilizing violence across the country are feared if the January 16 parliamentary election is delayed. "Any attempt to postpone the coming election will lead to a constitutional vacuum that this country will face, because the current Iraqi parliament will lose its legitimacy after January 16, 2010, which will cause a wave of chaos in this country that could ruin all that we've achieved," al-Maliki has said. But Iraq has yet to sort out key election details, which could postpone the voting. Iraqi lawmakers have been debating a revised election law, but the northern city of Kirkuk has been a stumbling block. Kurds displaced under Saddam Hussein's rule have settled on land and in homes they say are rightfully theirs. However, Arab and Turkomen residents say many more Kurds have moved into Kirkuk than were displaced, and that allowing them to vote would create an unfair advantage. The other dispute centers on open or closed electoral lists. Open lists would name candidates and their parties; closed lists would name only parties. Existing law, used in the 2005 election, mandates a closed list. Al-Maliki supports an open list. The United States and the United Nations worry that, if a new law isn't adopted, the government might have to delay the election or rely on the old law. The election is a vital step in the Iraqi government's efforts to solidify a democratic system in the post-Saddam era and is being closely watched by American officials. A security environment and political stability during and after the polls will be key as the United States looks to withdraw combat troops by next August, leaving 50,000 in advisory roles, and then withdraw all U.S. forces by the end of 2011. Earlier this month, U.S. Ambassador Christopher Hill and Gen. Ray Odierno, the top U.S. military commander in Iraq, urged the Iraqi parliament to expeditiously decide the election law. Despite improved security and decreased violence in Iraq, authorities remain concerned about coordinated attacks, such as those that occurred in Baghdad in August and bombings in Anbar province Saturday. Al-Maliki is in Washington this week for a conference aimed at shifting the focus of the relationship between Iraq and the United States from the military to business. But he has been dogged by the election situation. After a meeting with al-Maliki on Monday, U.S. Secretary of State Hillary Clinton said it was critical that the election takes place as planned. "Obviously, we are supporting the efforts to ensure that the elections are credible and legitimate, and that a new government is formed in a timely way to continue the peaceful stability and economic growth that is so important," Clinton said. Meanwhile in Iraq, four people were killed and 19 were wounded in a series of attacks in Tuesday morning, authorities said. The four people were killed and 11 were wounded in a car bombing in the town of Saqlawiya in central Iraq. Three policemen were among the dead, officials said. Three civilians were wounded when a bomb on a bus exploded in northwestern Baghdad, three were wounded by a roadside bomb the same area and another two by a roadside blast in the west of the city. In northern Iraq, a U.S. soldier was killed and two others were wounded by a roadside bomb in northern Iraq, the military said Tuesday. The attack occurred Monday in Nineveh province, according to a news release from the Multi-National Division North. The Multi-National Division North is responsible for areas including Balad, Kirkuk, Tikrit, Mosul and Samarra, according to its Web site. The name of the dead soldier was withheld, pending notification of next of kin. No further information was immediately available.